I have wanted to make a string quilt for ages and just hadn't gotten around to it. I like things planned out, and the general "throw-it-up-there" scrappiness just isn't my thing. Kind of out of my comfort zone if you know what I mean. Stacey started showing her color-controlled versions and I thought, "I LIKE those! I could do one of those!" Then along came the StringThing Challenge and, I need something else to do like I need a hole in the head, but I just had to jump on the chance to start making string quilts. I sorted through my scraps and decided I would use my black and white scraps, but use the ones with all the wild colors in them for a child's quilt. I finished this top in about 15 days making a few blocks a day. It was made on phone book foundations that were about 8.5 by 8.5, cut down to 8" for a 7.5" finished block. I had actually cut the foundations a couple of years ago when I first had the impulse to make string quilts, and just never jumped into it. I still have to quilt and bind it, and figure it will take me the rest of the month to get that done. This quilt will either go to Quilts for Kids or to my guild's pile of charity quilts for local hospitals. I definitely will be making more and am inspired by all the beautiful quilts everyone is making. Keep it up! 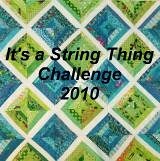 Check out my blog, I added my first completed string.